Nope, not finished yet... but our new house (and my new kitchen) are getting very close to being done. We went up to visit last week and got to see a lot of the lighting going in. It was also our first look at the faucets and countertops. With all the work going on a lot of things were covered up but I did get some pictures to show. This coming week they'll be finishing up in some rooms and soon it will be ready for the final inspection. Here's what I have to share. This is a photo from the builders sent after the counter tops and sinks were installed. For those who asked the island is a little more than 4 foot x 8 foot. I had to pull away some of the cardboard to take a peek while I was there. I love the modern looking drain board on the main sink. And my view!! The range is in place but not hooked up yet. Ovens in place, ignore the dust. My son and husband love the ice maker. Alex kept snatching ice cubes. The tile for the backsplash was delivered. It's from Trikeenan Tileworks and will look similar to this in place. The breakfast nook light, pulled up to be out of the way it will be lowered later The schoolhouse style lights over the island Check out the cute hat from Christo (aka doggybloggy) of ChezWhat? Thanks Christo! I love that it makes Alex look like a little lizard. When I read that Shelly of Musings from the Fishbowl was looking for volunteers to help create a birthday surprise for her mom I knew I had to join in. Shelly is a vegan foodblogger and former Michigander who currently lives in France. Her mom's 60th birthday was coming up and she still lives in my neck of the woods in MI. I don't think you could get me to turn down an opportunity to bake a birthday surprise for someone. Shelly gave me the clues that her mom used to like turtle candies and wasn't a big fan of lots of butter cream. Even though I do bake with eggs and eat meat occasionally, I wanted to play the surrogate daughter and bake some vegan cupcakes in Shelly's place. With my husband as a sounding board I came up with a turtle cupcake with a pretzel crust bottom for saltiness, chocolate cake, my vegan caramel cooked softer for a filling, freshly toasted pecans, and a blob of fudge frosting for the turtle body. Since my son was hanging around looking for samples I made a vegan version of the yogurt cake he's been so fond of lately. Half I flavored with lemon and half I added matcha (powdered green tea) to. The matcha got Alex's new favorite frosting, dairy-free white chocolate ganache, and a little slice of candied ginger to make them pretty. The lemon cakes I topped with strawberry filling reminiscent of pie filling. Great strawberries are finally coming in, though it's still months before they are the best local ones. I grabbed a bunch of fragrant organic ones on my last trip up north. My favorite cupcakes were the strawberry/lemon ones. They are brightly-flavored and make me think of spring and summer on the way. Alex loved the lemon cake but would have preferred the white chocolate ganache with it. I guess I have an Easter cake pairing all set there. The matcha cakes still needed a little more green tea flavor and I would chop the ginger into finer pieces next time because the bite with the ginger was just perfect. Alas, I was only somewhat satisfied with the turtle cupcakes. The caramel was lighter than I would have liked and the flavor was lost in the chocolate cake. The pretzel crust was tasty but it needed a little more margarine and sugar to be perfect. My husband John isn't eating sweets right now but I made sure to freeze some of the extras so he can try them and give me a solid critique. The turtle cupcakes will be getting a second run with a different caramel method, improved pretzel crust and vanilla cake. I'll post the recipe when I'm happy with it. Until then here are pictures of my baking and the recipe for the strawberry/lemon cakes. Inspiration taken from the FatFree Vegan Kitchen recipe Strawberry Snack Cake and the Tofu for Two recipe Fragrant Lemon Cake. 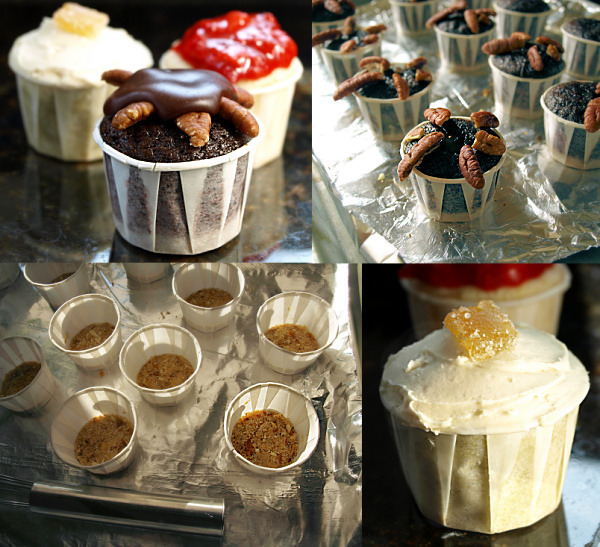 -Preheat your oven to 350 degrees F. Line a mini cupcake pan with papers or lay out your mini nut cups on a baking sheet. I use Wilton Mini Nut Cups and I always snip the rolled edge in two spots so that the papers can be ripped off easier. Make the snip just through the edge and you won't be able to tell. You will have to inform the recipients to pull at the snipped spots. -Prepare the strawberry topping by placing the strawberries, sugar from the topping ingredient list and cornstarch in a cold saucepan. Gently toss the strawberries in the sugar and cornstarch to coat. Place the saucepan over medium-high heat and cook, stirring occasionally gently, until the strawberries release some of their juices and the juices bubble and thicken. Remove from heat and add the lemon juice to taste. Cooked strawberries lose some of their brightness and the lemon juice will pick that back up. Place the strawberry topping in a bowl, cover and refrigerate. You want the topping cold or it will slide off the cupcakes. -Begin making the cupcake batter by beating the margarine and powdered sugar in a stand mixer until light and fluffy. -Add the yogurt a tablespoon at a time, beating between each addition. Add the soy milk, lemon juice, lemon zest and vanilla one at a time and beat again until everything is incorporated well and the mixture is fluffy like frosting. You will need to scrape the bowl a couple of times. -In a separate bowl, whisk together the flour, baking powder, baking soda, and salt. Add half of the flour mixture to the margarine mixture and beat until mostly incorporated. Add the rest of the flour mixture and beat just until smooth. -Fold in the almond meal. Spoon (or scoop with a small disher) the batter into the snipped nut cups or lined mini cupcake pan. Fill each cup three quarters full. -Place in the center of the preheated oven and back for 14-17 minutes, until a toothpick inserted in the center comes out clean. Cool completely. The cakes will fall some while cooling. -Top each cooled cupcake with a spoon of strawberry topping and serve. I was surprised to learn this month's Daring Baker challenge. Baking to me means cookies, cakes, bread, and pie--I guess sweets just naturally dominate my brain. Making lasagna seems more like cooking than baking and it's one of those dishes that relies on cheese to make it so delicious. I've made a few dairy-free lasagnas for my son but they were bare bones dishes: layers of meat with sauce, a layer of broccoli (one of the two green vegetables he deems edible) thrown together with dairy-free soy cheese and noodles from a box. Certainly nothing exciting enough to post. However the challenge of making my own spinach lasagna noodles kept me motivated. I've made a lot of pasta for homemade ravioli and pierogi and occasionally for hand cut noodles but have never attempted spinach pasta or making the large sheets needed for lasagna. So I took that spark of excitement and decided to wing the rest. A look at my mostly bare fridge gave me the idea to replace the meat ragu with a tempeh version. This I spiced with a secret ingredient of mine, Italian sausage seasoning. The fennel and pepper taste is great with green vegetables and in homemade meatballs for soup. Poking further I found a forgotten celery root and had another bright idea. Typically vegans and those who eat dairy-free replace soy milk in the milk-based bechamel sauce found in lasagna, but the taste has never been top on my list. The flavor of celery goes so well with tomatoes and I knew it can be made into a super smooth puree. So I spiced it up bechamel-style with nutmeg and white pepper to use in my lasagna. The spinach pasta wasn't the walk in the park I expected. I'm not sure if I chopped my spinach too fine or if I just had very juicy spinach but I needed a lot of bench flour to get the pasta dough workable. It was really sticky! Eventually it worked out and I was really happy with how thin I got my sheets of lasagna noodles. The color on the cooked noodles was impressive too. It has me ready to try again and make spinach tagliatelle with basil pesto. I thought about replacing the Parmesan called for in the recipe with oil and garlic toasted breadcrumbs, something I'd seen on Kalofagas recently, but laziness won out and I used some Follow Your Heart vegan mozzarella cheese. The melded taste of the spinach pasta, rich tempeh sauce with the creamy cheese and celeriac puree was wonderful. Everything was gooey and the flavors mingled so well. The celeriac bechamel has renewed my interest in making dairy-free lasagna. Once again, I'm happy the Daring Bakers pushed me in a new direction. -For the complete original recipe visit this month's hosts: Enza of da grande, Melinda of Melbourne Larder and Mary of Beans and Caviar. -The author of the original recipe is Lynne Rossetto Kasper, you can find her online at The Splendid Table. -See more lasagna creations by visiting the Daring Bakers' Blogroll. -If you'd like to join in or learn more about the group, come see the gorgeous new site: The Daring Kitchen. This is my adaptation of Lasagne of Emilia-Romagna (Lasagne Verdi al Forno) from The Splendid Table: Recipes from Emilia-Romagna, the Heartland of Northern Italian Food by Lynne Rossetto Kasper. *You can begin by making your pasta and letting it dry while you make the fillings or by making the fillings and then setting them aside or refrigerating and reheating them while you make the pasta. I made the pasta first and allowed it to dry only slightly. That is how these directions are written so I can remember what I did for next time. 1. Prepare your lasagna noodles. I used half of the provided recipe for Spinach Egg Pasta (Pasta Verde). You can see the complete recipe with instructions here. The ingredient amounts for a half recipe are: 1 egg, 5 ounces of fresh spinach, and 1 3/4 cups (7 ounces) of all-purpose flour. I needed more flour to make the dough workable and not crazy sticky. There will be a little dough leftover. You can cut it into noodles and save it for later or just cook it, throw some butter/EB on it and have a snack. For a vegan/egg-free option, try this Vegan Pasta Recipe, scroll down for the spinach version. This should give you more than enough and some extra pasta as well. 2. After your pasta is made and set aside to dry a little, make your fillings. My recipes are included below. Set the finished fillings aside. 3. Preheat your oven to 350 degrees F and bring a large pot of salted water to a boil. When the water comes to a boil, prepare a large bowl of ice water and spray an 8-inch square baking pan with spray oil. 4. Grate 5 ounces of Follow Your Heart vegan mozzarella cheese and set aside. 5. Boil the lasagna noodles for 2 minutes. *If you dried the noodles overnight or longer, then you should boil them for 4 minutes. Cook just 3-4 noodles at a time, transfering them with a handled strainer to the ice water when done. 6. When your noodles are ready, lay a thin layer of the celeriac puree onto the bottom of the baking pan and cover it with a few layers of noodles. If you get your noodles very thin use 2-3 layers of noodles. If they didn't come out as thin, use just 1-2. I recommend straining and patting the noodles a little with a clean dish towel or paper towel to avoid making your lasagna watery. 7. Add another layer of puree and top it with a layer of ragu then sprinkle on 1/3 of the cheese. Add another couple layers of noodles and repeat the puree, ragu, and 1/3 of the cheese. Top with a final layer of noodles. Spread the remaining celeriac puree on to the top of the lasagna and sprinkle over the rest of the cheese. 8. Cover with aluminum foil, making sure the foil doesn't touch the surface of the lasagna. Bake in the center of the oven for 40 minutes. Remove the foil and bake for another 10 minutes. 9. Turn on your broiler and raise the lasagna to the top rack. Broil for 1-3 minutes to brown the vegan mozzarella, checking every minute so that it doesn't burn. 10. Remove the lasagna from the oven and cool for 5-10 minutes. Cut and serve. For use as a dairy-free bechamel sauce replacement in a 8-inch square lasagna. I plan to make this again and use a slightly larger celeriac or two roots because I think more would be good in the lasagna. This amount melded in nicely though. -Chop the peeled celeriac into a 3/4 - 1 inch dice. Place in a pot with the garlic clove and add enough water to cover. Season the water with salt until it tastes as salty as tears. -Bring the pot to a boil and boil ~7-9 minutes, until the celery root is tender all the way through. You can check this by stabbing a piece with the tip of a knife. -Remove the pot from the heat and drain the water off. Save 1/4 cup of the cooking water. -Place the drained celeriac and garlic into a food processor and add the margarine (or butter) and 2 tablespoons of the cooking liquid. Process until smooth. This could be done in a blender as well. -Check the puree to see that it is the consistency of soft mashed potatoes, add more cooking water if needed. Add the nutmeg and pepper and process to distribute. Taste for seasoning and add salt, more nutmeg or pepper if desired. -Store for assembly later in the fridge or use shortly. The puree should be warm when added to the lasagna. *This is a mixture of ground fennel seed, salt, pepper and a little sugar. You can replace it with a home mixed version of those ingredients or just use whatever pasta herb/spice seasoning you prefer, just add to taste. -Pulse the tempeh in a food processor until it forms a coarse meal, think Grape Nut size. You can also grate the tempeh on the large holed side of a grater. -Heat the oil in a skillet until a crumb of tempeh sizzles a little when added. Add all the ground tempeh and cook over medium-high heat until at least half is golden brown, stir often. This should take 2-3 minutes. -Turn the heat down to medium-low and add the garlic and sausage seasoning. Stir to distribute and heat just until the garlic becomes fragrant. -Add the pasta sauce. Cook on medium high until bubbling and hot, cook and additional 2 minutes, stirring occasionally. -Remove from heat and allow to cool slightly or store in the fridge for use later. Like the celery root puree this should be added to the lasagna warm. A lot of people with dairy allergies eat Oreos but they haven't worked out for us. A couple of times my son has had questionable reactions on days when he ate them. On top of that I object to the HFCS in them and prefer making cookies to buying them. Who doesn't love the smell of freshly baked cookies? So when I saw a Thomas Keller version of Oreos on the blog Jumbo Empanadas I had to give it a try. I used the ratio for white chocolate ganache that I finally perfected during my yule log trials this December and my favorite cocoa, Green & Black's. The dough is a little fussy to work with but well worth it. The cookies are very tender and very chocolaty. The white chocolate ganache was wonderful and I'd consider making the next batch double stuf'd (IE double the amount of ganache). My husband loved them but I think my son would prefer these made with vanilla or lemon cookies. He's just not that into chocolate. I think a batch of lemon shortbread sandwich cookies would be perfect for Easter but have to do some lemon shortbread research first. Does anyone have any good recipes? For those who can use real butter and cream please look at the following recipes, I adapted my recipe from Jumbo Empanadas' recipe for Baby TKOs. The original recipe comes from Thomas Keller in Essence of Chocolate. -Add the white chocolate, soy milk and margarine for the filling to a microwave safe bowl. Microwave on high for 1 1/2 minutes. *If you haven't microwaved chocolate before then check every 30 seconds and stir to make sure that the chocolate doesn't burn or use a double boiler instead. You don't want the chocolate to melt completely in the microwave. Instead you want to just warm the whole mixture and melt the chocolate most of the way in the next step. -After microwaving, remove the chocolate and stir with a whisk until the mixture becomes homogeneous and smooth. It will look separated for awhile but keep stirring and it will eventually come together. If after stirring for a minute there are still large pieces of unmelted chocolate then you can microwave the mixture for 15 seconds once or twice to warm it enough to melt. -Set the filling aside at room temperature for 30 minutes to 1 hour. Or chill in the fridge to make the process go faster. It will thicken further as it cools but you can rewarm it before using by carefully microwaving the mixture for 10-15 seconds to make it workable again. In this time get started making your cookies. -Preheat your oven to 350 degrees F and line two baking sheets with parchment paper. -Add the flour, cocoa, sugar, baking soda and salt to the bowl of a stand mixer and stir together with the paddle attachment until mixed thoroughly. -Add the room temperature margarine a bit at a time while the mixer is running. Mix until the dough starts to come together in a cohesive ball. -Knead the dough a little on a floured surface until it is holding together nicely. Divide the dough in half and roll out one half between two sheets of parchment paper. The dough will still be fairly sticky. Cut out 2-inch circles of dough and carefully transfer them to the lined baking sheets, leaving a 1/2 inch between each cookie. Gather and reroll the scraps and repeat with the remaining dough until all dough is used up. -Bake for 10-12 minutes. Cool the cookies on the baking sheets for at least 10 minutes before transferring them to wire racks to cool completely. -Flip half of the cookies over and pipe or spoon on ~1 teaspoon of filling onto each cookie. Place another cookie on top and give a gentle squeeze to spread the filling between the two cookies. You may need to warm your filling in the microwave for 10-15 seconds to get it pipable. It should be the consistency of mayonnaise when piped. -Dunk in (soy, rice, nut, cow's, hemp) milk and enjoy! I'm adding this to Bookmarked Recipes, an event started by Ruth of Ruth's Kitchen's Experiments. Visit the new Bookmarked Recipes site on Monday for the roundup of other bookmarked and tested recipes. This week’s round up will be hosted by Psych Grad at Equal Opportunity Kitchen. This year I've amassed quite a lot of ideas for Easter but with the packing I need to do for our upcoming move and the tax paperwork still to do (ugh), I'm not sure what I'll actually manage. So here's a list so that I don't lose any I can't find time for. Two fellow Michigan foodbloggers made homemade versions of classic Easter candy. -Melitta from Cafe Chocolata made Homemade Kinder Surprise. I bought some new Lego mini-figures to place in the ones I'm going to make for my son Alex. -The ultimate Easter treat, Cadbury Creme Eggs, was recreated at the Speedbump Kitchen. Her Egg-free Creme Eggs are egg and dairy-free and don't even require cooking except to melt the chocolate. It's my husband's dream come true! I also collected ideas from Better Homes and Gardens Easter Recipes and Craft Ideas. -These Egg-shaped Cereal Treats are the perfect quick addition to an Easter basket. You could make these really colorful with the right cereal. -The Piped Easter Egg Cookies are so cute! I love that you don't need an egg-shaped cookie cutter to pull them off. I'm going to give them a try substituting dairy-free margarine for the butter. *The egg cookie photo is not my photo but property of BHG, permission was obtained for it's use. The allergy-safe Easter candy selection is expanding wonderfully this year. -Chocolate Emporium is my longtime source for dairy-free white chocolate. I also always buy a couple of their strawberry white chocolate bunny pops because they're Alex's favorite. -I bought truffles and filled hearts from Premium Chocolatiers for Valentine's Day after reading a review from Alisa of One Frugal Foodie. Their dairy-free milk chocolate hearts were a huge hit with Alex. For Easter they're offering dairy-free milk chocolate bunnies and other Easter chocolates. -Divvies is another source for dairy and nut-free chocolate bunnies. Alex doesn't care for the dark chocolate in their bunnies but he loves their cookies. We always let him get one when we visit the Great Wolf Lodge in Traverse City. I'm hoping to have another go at natural egg dyeing again this year. The photo below is of my Easter eggs from last year and this post has my thoughts on what worked and didn't work for me. I'm going to try the grape juice and orange peel recipes from BHG's Natural Easter Egg Dye Recipes this year. I cook corned beef fairly regularly so when Saint Patrick's Day came around I wanted to come up with another food to celebrate the holiday. I saw a recipe for Wholemeal-Almond Biscuits featured as the Martha Stewart Cookie of the Day and it seemed like a wonderful twist on digestive biscuits, which I love. I wanted to use up some oat flour and thought it would give these a nudge towards being more Ireland-inspired. The thing is...digestive biscuits always remind me of Canada. I grew up in Detroit and Ontario was a favorite place to take a day trip. We'd go to Point Pelee for swimming and to see the birds and migrating monarchs. Windsor was for the parks, ethnic restaurants and indie foreign films. When the dollar was strong we'd go shopping. What fascinated me a lot when I was young was the "exotic" items in the grocery stores. Everything with English and French on the label, the unfamiliar candy bars and the digestive biscuits. What an odd name for a tasty, almost cookie cracker. I loved bringing home a box. So maybe I failed somewhat when it came to invoking the spirit of Saint Patrick's Day. I'll just have to make them on July 1st instead. It doesn't matter, these cookie/cracker/biscuits were wonderfully tasty. They're nutty, just a little bit sweet and the tiny hint of cinnamon is perfect. I brought some to a family get together and they were a hit served with an Irish cheese with stout. I had to make a second batch to share them here. -Toast your almonds, here are some good instructions. The original recipe calls for skinned almonds but I used sliced almonds with the skins on for more fiber. Almond meal is not recommended because it's very hard to evenly toast already ground almonds. Instead use whole, sliced or slivered almonds. Allow the toasted almonds to cool. -Place the almonds in a food processor and pulse to create a coarse meal. Add the flours, sugar, salt and cinnamon. Pulse again until everything is thoroughly mixed and there are no large pieces of almond. Be careful to not over process. -Cut the margarine into small pieces and add to the food processor. Pulse a few times until there are no pieces of margarine larger than a small pea. -Sprinkle the ice water over the flour mixture and process until the dough comes together into a ball. Wrap the dough in plastic wrap and chill for 45 minutes to 1 hour. I found that with my margarine version the 30 minutes from the Martha recipe wasn't long enough. -Preheat your oven to 350 degrees F and line two large baking sheets with parchment paper. -Remove the dough from the fridge and roll out half to just under 1/4 inch thick. Use all-purpose flour to lightly dust your work surface and the surface of the dough. !/4 inch is thinner than the original recipe but I preferred the thinner biscuits. -Cut out 2 inch circles of dough and transfer them to the lined baking sheets with an offset spatula. Space the biscuits at least 3/4 inch apart. -Gather your scraps and repeat the rolling and cutting to use all of your dough. -Bake for 20-25 minutes until golden brown on the edges and bottoms. -Serve with tea, jam and/or cheese (dairy-free or dairy). Beer and cheese wasn't bad either. These were excellent with homemade blueberry jam I got for Christmas. I love getting the honor of cake duty. It gives me a chance to bake something and it's a relief knowing there will be cake for my dairy allergic son to enjoy. While I know my stuff when it comes to making a cake tasty I'm unfortunately still learning a lot about layer cake construction and decorating. About a month ago I made a cake for my niece and nephew's joint 18th birthday party. It was a layer cake made with my favorite chocolate cake recipe, around here we call it "THE Cake". I filled it with a super thick layer of marshmallowy meringue frosting and covered it with dairy-free chocolate butter cream. At home it looked picture perfect but metro Detroit is ever spreading and that super thick layer of filling combined with the egg-free cake didn't survive the trip across town. The filling smooshed out the sides and it arrived a big mess, though at least it was still delicious. It was my own personal Ace of Cakes style nightmare and I was devastated. For my next shot a cake duty I was on a mission to redeem myself. The cake request was for chocolate with fruit so I decided to make a Black Forest cake using my last pack of frozen Traverse City organic sour cherries. For the cake layers, I went with my second favorite chocolate cake which is more structurally sound due to eggs in the recipe and a yogurt cake that has been super popular with my son Alex recently. I made fudge filling for one set of layers and cooked the cherries with sugar and tapioca starch to make a cherry filling. Then I frosted the exterior of the cake with meringue frosting. I flavored both the yogurt cake and the meringue frosting with Grand Marnier, plus a little orange extract in the cake. Despite a little snag where I would have liked more meringue frosting for decorating the outside-- the cake came out great! I liked the tiny touch of orange/Grand Marnier flavor. The yogurt cake has quickly become my son Alex's favorite cake. He gobbled up the extra unfrosted cupcakes and was full of praise for them. I was careful to not overfill the inside though I think next time I'm going to try cutting all the layers in half and adding more thin amounts of filling. The best part is that the cake survived an hour on my lap in the car! This recipe is adapted from Orangette. So far I've made this with lemon and orange with Grand Marnier but I think it could also be adapted easily to make a tasty vanilla cake. Makes 1 (9-inch round) cake layer, for the thinner layer in the Black Forest cake I made 4 cupcakes along with the 9-inch cake. -Preheat your oven to 350 degrees F and line the bottom of a 9-inch round cake pan with parchment paper. -Sift together the flour, baking powder and salt and set aside. -Beat the eggs until light colored and fluffy, approximately 2-3 minutes on a stand mixer with the whisk attachment. -Add the sugar, yogurt, oil and flavorings to the beaten eggs and beat just a little to combine. -Add in the dry ingredients and beat just until a smooth batter forms. -Spray the cake pan with spray oil and pour in the batter. Gently knock the pan to release any large air bubbles. -Bake for 25-30 minutes, until a toothpick inserted in the center comes out clean or with just 1-2 crumbs attached. -Cool for 10-20 minutes and then invert onto a wire rack to cool completely. This recipe is adapted from Smitten Kitchen. It's my second favorite chocolate cake that I use when I want to make a cake with multiple layers that is more structurally sound. -Preheat your oven 300 degrees F and line the bottoms of two 9-inch cake pans with parchment. -In two separate cups, mix the soy milk with the vinegar and the hot coffee with the chocolate. Set aside while you prepare the other ingredients. The vinegar will clabber the milk and the chocolate will melt in the hot coffee. Stir the coffee cup at least once. -Sift together the sugar, flour, baking soda, baking powder and salt. I recommend double sifting these ingredients. -Beat the eggs in a stand mixer with a whisk attachment for 2-3 minutes until light colored and fluffy. -Add the coffee mixture, which should be lukewarm, the clabbered soy milk, the oil and the vanilla to the eggs. Beat a small amount to mix together. -Add the sifted dry ingredients in three doses, beating between each addition a little to almost combine. Beat again until the batter is smooth but do not over beat. -Spray the lined cake pans with spray oil and fill evenly with the cake batter. -Bake for 45-50 minutes, until a toothpick inserted in the center comes out clean or with just 1-2 crumbs attached. Rotate the cake pans after 20 minutes for more even baking. -Cool the cakes in the pans for 10 minutes and then remove and cool thoroughly on a wire rack. I didn't have as much frosting as I would have liked and would suggest making a double batch for a three layer cake. -Set up a double boiler with a saucepan and a large bowl. Bring the water in the saucepan to a boil and then turn it down to a simmer. -Add all the ingredients to the large bowl and set on the saucepan. Beat with a handheld mixer on high until frosting is thick, creamy white and fluffy, for approximately 7 minutes. -Remove the bowl from saucepan and beat until mostly cool. -Add all the ingredients to a small saucepan and cook, stirring constantly, over medium-high heat until the sugar dissolves. You will see the grains of sugar disappear and the mixture will start to bubble. -Bring the mixture to a boil and boil for 1 minute. -Remove from the heat and pour into a metal bowl. Cool the mixture most of the way, stirring occasionally. -Use as a filling for layer cakes. Cake tales are never all sunshine and lollypops. I'm adding this to Bookmarked Recipes, an event started by Ruth of Ruth's Kitchen's Experiments. Visit the new Bookmarked Recipes site on Monday for the roundup of other bookmarked and tested recipes. This week’s round up will be hosted by Cristie at Edible Antics - Having Fun with Food. Our builders sent some pictures on Friday and I'm so happy with how things look. In the kitchen the big change is that the counter tops are in. The banquet seating and the range hood are also installed. They were cutting holes for faucets on Friday and the rest of the appliances should be moved in soon. I'm impatient as ever but look how close we're getting! We're planning on making a trip up this coming weekend to see everything in person. You gotta love the action shot of the hood installation. The hood is in place. Just think of the stuff I can burn and not set off all the smoke alarms. The banquet seating is in place. It has four drawers for storage. I have to start looking for a table! Counter tops!!! Apparently I haven't mentioned how cute all the carpenters are. Well here ya go. Thanks guys, it's looking great! Despite my denial (and complaining) winter is not yet over in Michigan. I could hear the snowflakes mocking me as they fell yesterday. Well I just had to make some wintery food and prove that I can take it no matter how long it lasts, even though I'm bluffing. In honor of St Patty's Day I had a corned beef brisket in the fridge. I was excited to try a glazed corned beef recipe that Kevin posted recently on his blog Closet Cooking. I could have made traditional boiled cabbage but all I had was red cabbage. Boiled red cabbage just doesn't really work. So I made a new twist on standard braised red cabbage. I added star anise and cloves because they go so well together. Apple, onion, and bay leaf I left in from my typical red cabbage recipe but I swapped most of the red wine vinegar for ume plum vinegar. Ume plum vinegar is a wonderful condiment. It's made from umeboshi plums and shiso (a Japanese herb) fermented with sea salt. The result is a tangy, salty condiment that gives a nice punch of umami flavor to dishes. Beware the salt in the ume plum vinegar though, I removed all the other salt in the recipe because the vinegar itself is quite salty. I liked the star anise, clove, cabbage combination a lot and was really happy with the added flavor from the ume plum vinegar. I can't say enough good things about Kevin's glazed corned beef. It's a great idea that combines sweet and salty with a little spice. It reminded me of Easter ham and my husband and son both loved it. The only addition I would make to his recipe would be to remind people to trim down the fat from the brisket before baking it with the glaze. -Cook the onion in the oil in a large soup pot until soft and translucent, allowing the onion to caramelize a little is good but not necessary. -Add the rest of the ingredients to the pot and stir together. -Cover and cook over medium-low heat, stirring occasionally, for 1 hour to 1 1/2 hours. The cabbage will be tender and the flavors will have melded together. -Pick through to remove the star anise, cloves and bay leaf or warn your guests that these whole spices are not meant to be eaten. -Serve hot. Additional ume plum vinegar can be served on the side to adjust the seasoning to individual tastes. Remind your guests that this vinegar is salty and should be used in place of additional table salt. I'm adding this to Bookmarked Recipes, an event started by Ruth of Ruth's Kitchen's Experiments. Visit the new Bookmarked Recipes site on Monday for the roundup of other bookmarked and tested recipes. This week’s round up will be hosted by Patsy of Family, Friends & Food. Marx Foods is giving away 2 POUNDS of MORELS!! How can you resist entering? I'm very eager to see how the morel patch I planted last fall will fare this year. I'm also hoping, praying, and pleading that we'll be moved in and settled so that I can attend the two mushroom festivals in my new stomping grounds in Michigan. First there is the Mesick Mushroom Festival and then the following weekend there is the National Morel Mushroom Festival in Boyne City. Michigan cherries are nice and all but morels are swoon-worthy. -More information about the National Morel Mushroom Festival in Boyne City, MI (May 14-17 2009) and the 50th Annual Mesick Mushroom Festival in Mesick, MI (May 8-10 2009). -My new house is coming along, see the latest pictures at Building on Dog Hill. This is my submission for the BloggerAid cookbook. The BloggerAid group consists of food bloggers from around the world looking for a way to help solve world hunger. Since I'm moving to the cherry capital I made a super moist upside down cake with two kinds of sour cherries. If you'd like to see the recipe, the cookbook should be available by the end of this year with all profits from the sale going directly to World Food Program's School Meals. If you'd like to submit a recipe here's more information, the current deadline is March 31st. *Ok not really, I teased her with a cat toy but I'm sure happy spring is on the way. I'm sick with my first cold in over a year and really ready for winter to be over. In the past months I've paid my dues eating lots of local rutabagas and turnips but now I need a break. So I'm indulging myself with blood oranges and herbs from points south. Have you seen the prices on blood oranges? Just a few years ago you'd have to pay a buck an orange and now they're less than $2 per pound. Of course the ones on sale are tiny but they're still a nice break from Midwest winter food. In my ongoing pantry cleaning, I found the last box of quinoa left from 2008. Recently I found a more foolproof method for cooking quinoa. The key is to let the grains rest in the middle of the cooking process. If you look closely at the quinoa in the closeup shot nothing is sticking together, the little curly-cue husks are still attached, there is just a tiny dot of uncooked middle and overall the quinoa is fluffy with a nice bite. I paired the quinoa and blood oranges with fresh parsley and mint and a light dressing. For a short while it kept me from thinking about winter dragging on outside. -Place the quinoa and water in a microwave safe bowl and cover loosely with plastic wrap. Cook on high in the microwave for 8 minutes. After the 8 minutes stir the quinoa, mixing any grains that climbed the side of the container back into the water. Recover loosely and let sit for 8-10 minutes. After that time has passed, cook again on high for 2 minutes or until there is only the faintest dot of uncooked center in the quinoa, like the center of al dente pasta. Uncover and allow to rest while you prepare the rest of the salad. -In your serving bowl, stir together the shallot, red wine vinegar, olive oil, salt and a few grinds of black pepper. Add the quinoa, parsley and mint and stir to coat everything evenly with the dressing. -Top with the blood orange supremes and serve at room temperature. This is my entry to Weekend Herb Blogging, a food blogging event created by Kalyn's Kitchen. The event is now run and documented by Haalo of Cook (Almost) Anything Once. Haalo is also hosting this week's roundup.